My family eats pizza for dinner every Friday, and I found myself short on the usual ingredients. I had to throw something together really quickly, and I made this BBQ Chicken Pizza on the fly. It turned out really good! Next time, I think I would add some pineapple tidbits, too. If you're a pineapple on pizza person, you would really like that! To make the crust, just combine the Bisquick, sour cream, and water. It will look dry, but if you use your hands to knead it, it will come together. Roll it out onto an ungreased cookie sheet. Spread the sauce evenly over the crust. 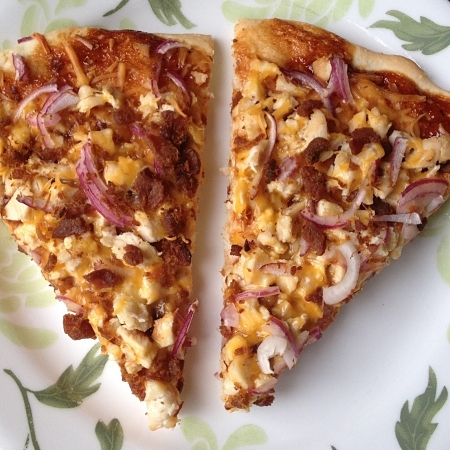 Top with chicken, cheese, onions, and bacon. Bake at 400 degrees for about 15-20 minutes, until crust is light brown and cheese is melted.